The O’Donnell Law Offices team has made a generous donation to the children of the McGlynn Learning Center in Wilkes-Barre, PA. The O’Donnell team provided warm hoodies and jackets to help keep the children comfortable and warm during the cold winter weather. 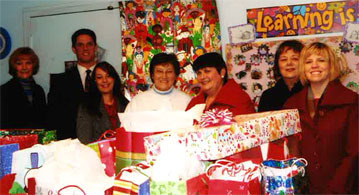 The McGlynn Center, www.mcglynncenter.com, is a family enrichment center located within the Boulevard Town Homes, 72 Midland Ct, Wilkes-Barre, PA 18702. The Center is a non-profit, volunteer-driven family educational center operated by the Sisters of Mercy since 1988. The facility provides educational, recreational and social outreach programs and services for hundreds of children and their families. O’Donnell Law Offices is a personal injury law firm located in Kingston, PA.